The German youngster successfully defended his Citi Open crown in Washington. In art and poetry, the German writer and poet Johann Wolfgang von Goethe once said, personality is everything. Perhaps, after watching Alexander Zverev last week, tennis should be added to that list, too. The 21-year-old from Germany, born to Russian parents, with the rockstar appeal, sandy-blonde mop-top hair, and (as I learned from interviewing him) a wry sense of humor, is currently ranked No. 3 in the world, behind Rafael Nadal and Roger Federer, two of the best that the sport of tennis has ever produced. Once again, he’s picking up right where he left off last summer, as one of hottest hard-court players on the ATP World Tour with his sights focused on winning the U.S. Open later this month. The young and mature tennis wunderkind, affectionately known as Sascha, plays with great confidence and authority – not to mention possessing a powerful serve – and, always, with a keen instinct that’s well beyond his years. Although his play at times looks effortless, it’s always entertaining. The Citi Open title was the third tour-level title this year for the versatile Zverev to go with trophies he lifted earlier in Madrid and Munich on clay. He’s won nine ATP titles overall, but is still looking for his first Grand Slam triumph. From observing him during the week against Malek Jaziri, his older brother Mischa, Kei Nishikori, Stefanos Tsitsipas and, finally, de Minaur, I couldn’t help but think that every time the tall (6-feet-6-inch, 1.98 m) and lean (189-pound, 86 kg) Zverev walked on the court, he painted word pictures with his tennis racquet while conquering all who came in his path. It’s worth noting that his ballet-like artistry on the tennis court was simply a thing of beauty that’s worth appreciating. Along with Tsitsipas and de Minaur, Zverev represents the future of men’s tennis. As Zverev readies to defend his Masters 1000 Rogers Cup title in Toronto this week, beginning with a second-round matchup against the 116th-ranked Bradley Klahn of the United States, one thing that impressed me about him during his week-long stay in the nation’s capital city was how he handled himself during his daily press conferences. Sascha came across as both relaxed and charming – even showing a keen instinct like he does on the tennis court by being quick with his responses to reporter’s questions – and, he exuded a playful side of himself that not many get to witness. 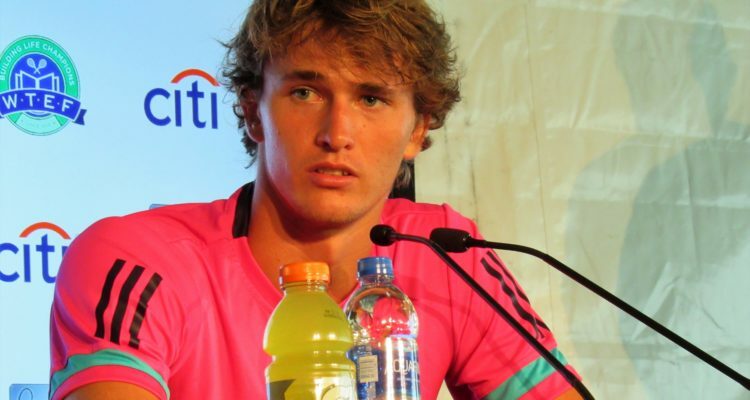 I sensed that Zverev enjoyed answering the media’s questions every day as he sat front and center on a raised platform before us, no matter how straight-forward, serious or light-hearted the questions might be. Each time, I came away feeling I learned something new about both sides of Zverev’s persona, as a highly successful tennis athlete and as someone whom many throughout the sporting world idolize. • On playing his older brother Mischa, Sascha reflected: “I enjoyed the moment. We played great tennis. I think we both played close to our best. I just enjoyed it out there … as much as I could. I hope everyone else did as well. This entry was posted in ATP 500 Washington, ATP Tour and tagged Alexander Zverev, ATP World Tour, Citi Open, Washington.